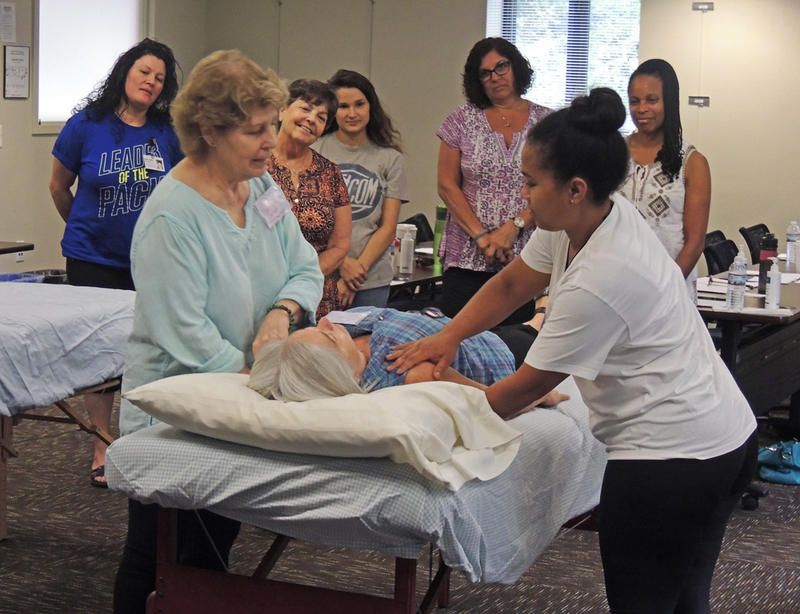 Hospice of the Chesapeake volunteers are trained on Comfort Touch, a healing arts practice, at the nonprofit’s administrative building in Pasadena, Maryland. Hospice of the Chesapeake has numerous volunteer opportunities available in Anne Arundel and Prince George’s counties. Volunteers play a vital role on the hospice team by visiting patients, supporting caregivers, serving as counselors at grief retreats, organizing fundraisers or assisting in our offices or inpatient care centers. Free training is provided; in fact, many enjoy taking advantage of the variety of complimentary learning opportunities offered to volunteers and staff. Become a hospice volunteer if you are age 18 or older and willing to complete volunteer training. Opportunities also exist for high school students and internships are available. Patient care: Provide companionship and a supportive presence for our patients and respite for caregivers. They offer a listening ear, open mind and loving heart to those in our care. Veteran-to-Veteran volunteer: These are patient care volunteers who have a military background who are assigned to visit patients who are veterans. Vigil volunteers: Available upon request to support patients and families during the final days and hours of life. Additional training provided. Honor Salutes: Active duty military personnel are needed to perform Honor Salutes, a formal ceremony for patients who are veterans to recognize and show our appreciation for their military service. Licensed cosmetologists: Provide haircuts and other grooming to our patients in their homes. Healing arts: Aromatouch, Comfort Touch and reiki practitioners (free training is provided), therapeutic musicians, artists and pet therapy dogs with their owners. Threshold Choirs: Sing with small groups at the homes and bedsides of hospice patients to bring ease and comfort to those at the threshold of living and dying. Grief support: Provide a caring presence either by phone or in person to support grieving individuals. Four-wheel drivers: Volunteers with four-wheel drive vehicles are needed to assist patients and staff in inclement weather. Contact joinus@hospicechesapeake.org or 443-837-1508 or visit www.hospicechesapeake.org for more information and to download an application.